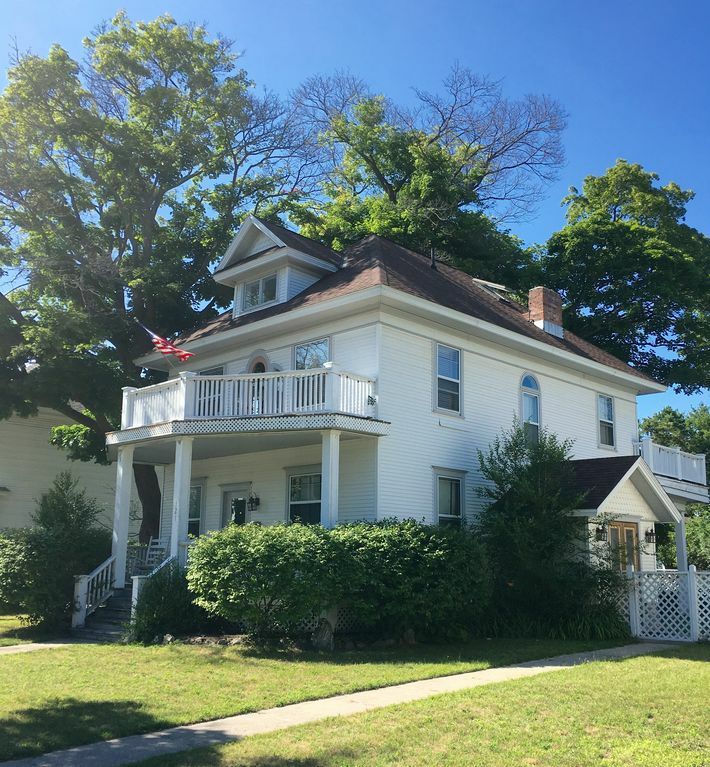 This charming cottage which sleeps 9-10 is situated two blocks off Lake Charlevoix in quaint, downtown Boyne City. This turn of the century home has been lovingly renovated and offers stunning architectural details. Perfect for two families or your extended family, there are two full kitchens and living areas so everyone has plenty of space. Three queen bedrooms plus a lower level bunk room with ping pong. There are two full baths. First floor queen includes twin bunkbeds with trundle. Second floor queen includes a toddler bed. Third floor queen occupies a private loft set off by french doors and overlooking the second floor vaulted living room. Ralph Lauren linens and down comforters throughout. You'll find plenty of quiet spots to read or nap. Four levels make up the house with three porches in all, two upper decks, front and back plus a covered porch off the front. The back deck adjoining the upper kitchen has a grill and outdoor dining. Also includes Internet. Just two blocks away is Lake Charlevoix. Access to the City Marina is right at the end of our street with a giant play structure, covered picnic area with grills, sailing lessons, ball diamond and lots more. A wonderful park is just a block away located on the River with a beautiful Gazebo. The Farmers Market resides here each Wednesday and Saturday morning. Concerts and other activities occupy the park throughout the summer. Young State Park is five miles up the road. The Mountain Grand Lodge boasts Avalanche Bay Waterpark, the largest in North America, along with many championship golf courses. The Soltice Spa is gorgeous. Also, great hiking and mountain biking trails. My husband and I and our three daughters have spent many special times at this cottage. We have always been skiers and our girls have developed into serious ski racers. We now spend every weekend here during the ski season and ski at Boyne Mountain when we are not traveling to nearby ski resorts for scheduled races. We have always loved the close knit community and laid back character of Boyne City. The people are real and the town takes you back to a simpler time when family spent meals and evenings together enjoying one anothers company. We first owned a smaller cottage directly across the street and purchased this one when our family got too big for the one bathroom and two burner stove. We have loved having the two living spaces for friends and family. Everyone is comfortable because they have their own space and conveniences. We have spent nearly every New Year's Eve at this cottage creating memories that will last forever. We live on Lake Erie in Ontario in the summer and are not able to enjoy Boyne City in the summer at it's best. That's why we are happy to share this special home with others who will hopefully fall in love with Boyne City like we have and want to return year after year to continue cherished family ties at a slower pace. Home is classy and has all the modern conveniences. Beautiful home perfect for skiing, shopping and getting around the area. Would recommend!! Thank you! Everyone of us were extremely happy with home and location. No problems with anything and just absolutely loved place and will be back and recommend . Beautifully clean home ! Great location!! We had the best weekend here! Home is just as pictured .. super clean and great location! Great place! It was just the way it appears on the site. It was clean. Spacious! It was nice to have the 2 floors. Allowed for privacy. The location is close to places to visit. A great place. Doesn’t get any better than this. We recently celebrated my parents' 50th anniversary by booking this home for a week's stay up north. Our group included six adults and four children. We were happy to find the house well stocked and comfortable. It offered a great location for visiting many northern Michigan highlights, as well as Boyne City itself. Downtown restaurants, the farmer's market and lake are all a short walk. Marcia was very responsive and helpful in planning our stay. Thanks for sharing your lovely home. Six miles from Boyne Mountain Grand Lodge, Avalanche Bay Waterpark, Soltice Spa, fitness and yoga center and many Championship Golf Courses. Young State Park 5 miles. Fly fishing available through Boyne Resorts USA. Mountain biking trails and bike paths for all levels.